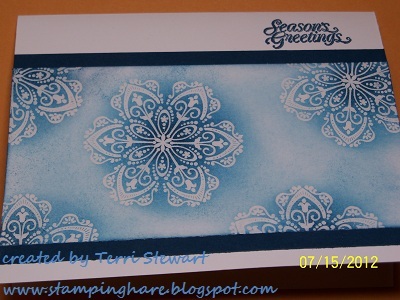 Terri here with another stamping project. I saw a holiday card on the Stampin Up demo-only website that I thought was so beautiful I couldn't wait to copy it! And then I loved it so much I included it as a club project and still loved it so much I made a video showing how to make it. That's a lot of love! Thank you Paula Dobson for sharing the original inspirational card!!!! What do you think? I hope you are feeling the love, too! This card uses one of Stampin Up's most popular stamp set, and one of my favorites, Mixed Bunch. Check out my online Stampin Up store, it's open 24/7. Click here to shop now! Stampin Up is has 3 great promotions--a FREE ribbon offer (through September), a new recruit offer (expires September 16), and a digital sale (ends 14 September. Click here for more details. Act now, for no regrets later! Terri, this is so beautiful. Thank you so much for your beautiful card. You are amazing. I'll be out and about soon and see what you're up to. I love your classes and miss them! I love and miss your classes too and this card is very pretty!